Seven out of 10 designers say that the open floor plan is still in demand. The two most important must-haves currently being asked for by folks doing a remodel design are a kitchen island and a recycling center. Both of these requests require a more spacious kitchen design. The kitchen island is almost a given in today’s kitchen. The recycling center is a new concept, and one that requires extra bin space next to the standard trash can. The low-slung, contemporary homes built in California in the middle of the last century set the precedent for indoor-outdoor living in the U.S. The popularity has also expanded the way we view the indoor kitchen. If you do not have the budget for a full outdoor kitchen use a patio or slider door linking the two. Have close proximity to the indoor fridge and food prep area. Lower counter tops and accessible appliances as well as easier to clean and maintain designs are needed for families with children as well as seniors. 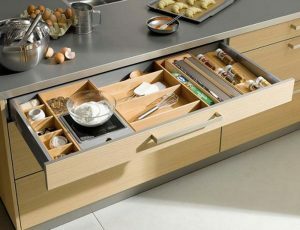 A few ideas are: refrigerator drawers for snacks, a drawer for kid-friendly cooking utensils, Lower counter top heights at the end of island counter tops, rounded edges, slip resistant flooring. We need to think about easy to access space for those of every age or ability. Just remember your kitchen layout is often quite flexible. A designer can redesign a layout that works well for you. If this is the first time your kitchen has been remodeled, you may want to change the layout to one of the specific kitchens styles such as, Galley, L-shaped and U-shaped kitchen. Once you decide upon a design that meets your family’s needs it will be easier to dress it up with all of your favorite colors and finishes.